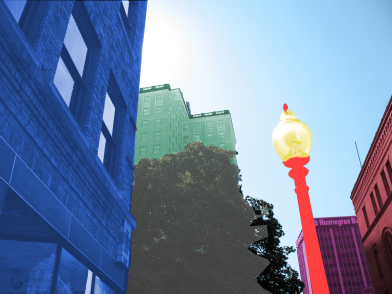 Your Monday Morning blast of my so-called “art” this week is a digitally-assaulted photograph taken on Lee Street, glancing upward at one of our nifty downtown lampposts, with some of the Charleston skyline buildings colored like the marshmallows in Lucky Charms cereal, in the background. It’s an exercise in color composition, for you art majors in the audience. Be sure to click the image to see a larger version. And you can also buy this image in the newly revamped Monday Morning Art Store, celebrating one whole year without a single sale! You can also follow these links to mock my efforts in the PopCult store and the Radio Free Charleston store. You may as well go look, even if you don’t buy anything. There’s sort of a train-wreck quality to the stores. This may seem like a strange request, but I don’t know who else to ask, and you guys know a lot of underground and non-mainstream stuff. Where in the Charleston area could i get a copy of September’s MOJO magazine? It’s about Pink Floyd. BTW, the picture is “strange” at this time of night, 1:45am. cool though. I’ve found MOJO at the FYE store in the Town Center Mall, and at Books A Million out at Dudley Plaza around Southridge. I’ve also made the trip to the Huntington Mall to pick it up at Borders on occasion.